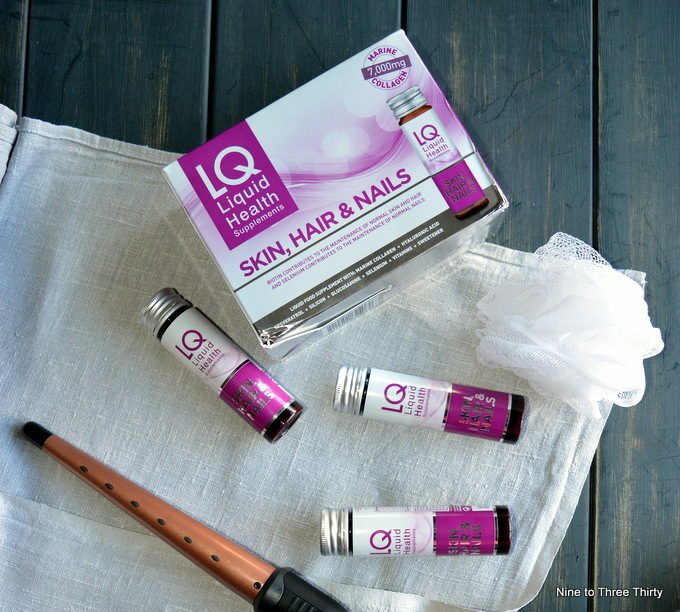 I was recently sent a month’s supply of LQ Liquid Health Skin, Hair & Nails to try out and review. I was interested to see if it could help me as at the start all three areas could do with some help. I have had a stressful few months which hadn’t helped, plus my swimming regime wasn’t perhaps the best thing for my hair. My nails were all broken and all different lengths. My hair was dry and struggling with the chlorine overload – I’d started wearing a hat and using special shampoo, but I think to an extent the damage was done. My skin was a bit lifeless and I had dark circles that made me look like I’d stepped out of the boxing ring. LQ Liquid Health Skin, Hair & Nails is really easy to take. Each day you drink one of the little bottles (size 50ml). It’s an easy to drink liquid and I would say it’s about the consistency of skimmed or semi-skimmed milk (but don’t worry it’s gluten, lactose & dairy free). I found it a little on the sweet side, but I soon got used to that. It’s pleasant to drink and not a chore at all. I found it easier to remember to drink a bottle rather than take tablets – I think because I could easily see whether I’d already taken it or not by whether there was a bottle to wash out and recycle by the sink or not. You just need to store in a cool, dry place and avoid direct light (so no need to keep in the fridge or anything like that). nature’s moisturiser and I’m sure you’ve seen it listed on many beauty products. Biotin contributes to the maintenance of normal skin and hair. Resveratrol is key beauty ingredient extracted from grapes. So how did I get on? Well I remembered to take a bottle a day every day for 30 days which is quite an achievement for me. My nails are looking great now. They are strong, healthy and a good length. My nails when they are in good condition have a good distinction between the white and the pink of them and I look like I’ve had a French manicure when I haven’t. That is how they look now. My hair feels a less dry now and softer, which is pretty good going when it is dunked in a chlorinated swimming pool for at least half an hour, four times a week. My skin has improved and the dark circles have faded. I’ve been working hard on my sleep lately which I think has helped with the dark circles too. I think I’d need to take it for a bit longer to be sure of the effect on my skin, but I am pleased with the results so far. Thank you Erica for your review I will definitely try it ? Some fantastic, just what I could do with for my nails, I need to buy some of this. This looks great, in winter my nails and hair and skin need some TLC. I like the name of the product too Liquid Health is really positive. This sounds interesting, I’m anaemic and my hair, skin and nails are all showing the side effects from it. I’ll have to check this out.